This Christmas and New Year season brings more cheers to all BSNL Mobile and Broadband customers across all telecom circles. BSNL has announced the launch of a New SMS STV which will work on Blackout Days also. The new SMS STV will offer 130 Free Local/National SMS to Any Network having validity of 2 days. BSNL already announced Blackout Day for all prepaid mobile customers on December 25, 2015 and December 31, 2015 for all Prepaid Mobile Customers of Kerala Circle. Blackout will be applicable to both SMS and Voice STVs which also include Plan Voucher Freebies, Pyari Jodi Free Calls. The above offer will be applicable as promotional offer on PAN India basis. The implementation of the tariff is to be made in accordance with 43rd Amendment of Telecom Tariff Order and orders/guidelines/clarifications issued by TRAI from time to time. All other terms and conditions will remain same. Customers are advised to make use of the Christmas & New Year Special Full Talk Time / Extra Talk Time Offers which are available from 22-12-2015 onwards. BSNL Kerala Circle declared Full Talk Time for Top Up 80 for a period of 10 days from 22-12-2015 to 31-12-2015. 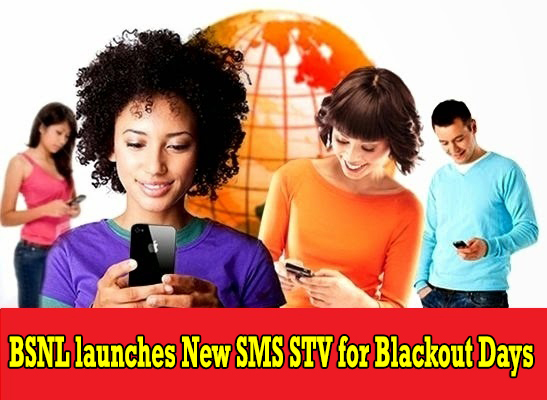 Dear readers, please share your views and opinions about the launch of this New SMS STV which is exclusively available on Blackout Days via comments with us.